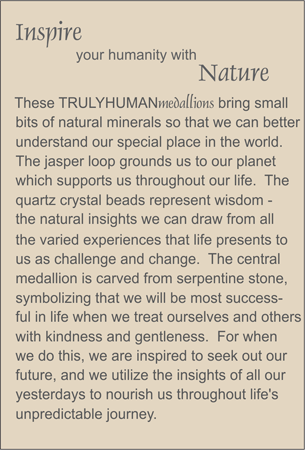 MEDALLION: Natural serpentine medallion in the form of a sculpted nugget. ACCENTS: Smooth rock quartz crystal ellipses. COMMENTS: This color is especially rich when paired with a bottle of cabernet or merlot. Scroll down to see styles with carved medallions.